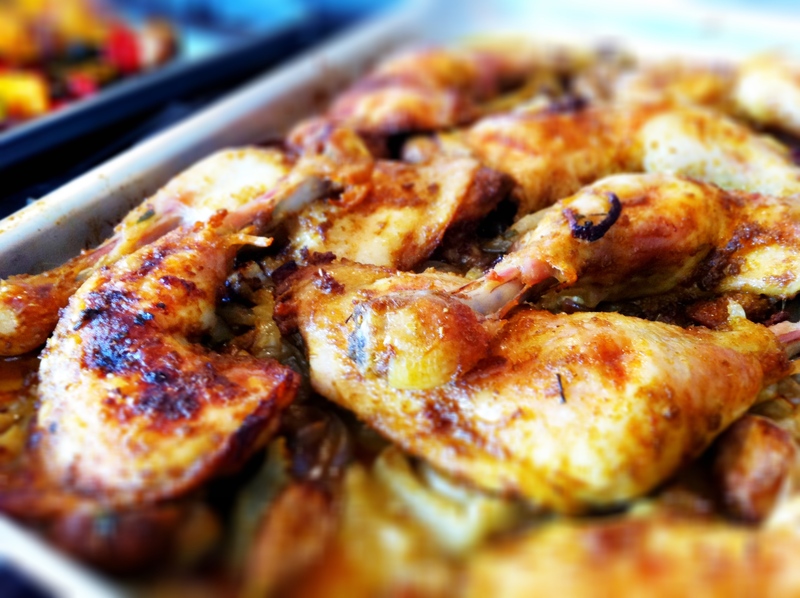 Oven-baked chicken with lemongrass, curry, fennel, onions, shallots and garlic. Place your chicken legs on a roasting tray. Season your chicken legs all over with salt and pepper. Pour 1 tablespoon of oil and then sprinkle the minced lemongrass, curry power and ginger powder over the legs and rub the oil and spices into your chicken legs thoroughly. Use silver foil to cover your chicken and allow it to marinade in your fridge or in a cold place overnight. The next day, preheat your oven to 200 degrees. Meantime, lift off the silver foil (don’t discard it as you’ll use it again) and place your chicken pieces on a plate. Take all of your cut onions, shallots, garlic and fennel and mix them together with your remaining 1-2 tablespoons of oil. Season with salt and pepper and then place your chicken legs skin-side down on top of the vegetables. Cover and seal your roasting tray with the silver foil again and bake in the oven for 20 minutes. Then turn your oven down to 180 degrees, discard the silver foil, give the tray a bit of shake (no need to stir the vegetables) and return the chicken uncovered to the oven for 15 minutes. Turn the chicken over skin-side up, give them tray another shake (you’ll find the fennel and onions starting to release their juices and mix with the marinade to create a lovely smelling sauce. Return to the oven for another 10-15 minutes. Allow the chicken to rest and transfer your chicken legs to a large dish or bowl. Make sure you pour all the lovely juices, garlic, fennel, onions and shallots all over your chicken before you serve it – that lovely sauce tastes fantastic poured over the cardamom-coconut rice.